Samsung has produced a new universal remote control for its range of internet-connected Smart TVs. The new accessory dispenses with a host buttons in favour of a touch-sensitive trackpad, while also adding voice control tech. According to the Nikkei Tech-On blog the company plans to launch the remote to accompany its connected TVs in the second half of 2012. Volume and channel change buttons are part of the touchpad, while there's a dedicated button for searching the internet and a microphone for changing channels, and more, through your voice. The move could widely be seen as an attempt from Samsung to strike before Apple's expected entry into the HD TV arena later this year. All signs point to Apple's flatscreen offering arriving with Siri-like voice control functionality, so is Samsung looking to tick all of the boxes before Apple has the chance to "redefine what a television can do"? 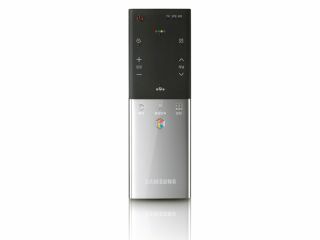 Samsung, which launched a similar remote at CES 2012 minus the touchpad, isn't the first manufacturer to bring voice control into play. LG's Smart TV with Google TV offering brought a new version of its motion-sensing Magic Remote with a qwerty keyboard and voice control on board.